Bangalore, February 5, 2018 –– Trend Micro Incorporated (TYO: 4704; TSE: 4704), a global leader in cybersecurity solutions, was again named a Leader in Gartner, Inc.’s 2018 Magic Quadrant for Endpoint Protection Platforms, , one of three vendors out of a total of 21 companies valuated. 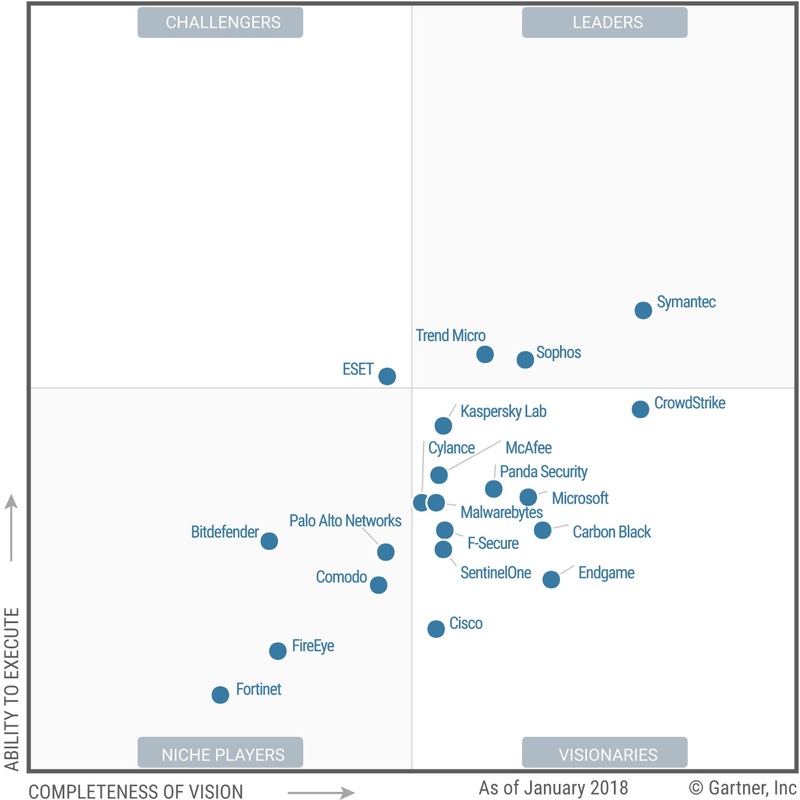 Trend Micro has been identified by Gartner as a Leader in every Magic Quadrant for Endpoint Protection Platforms published since 2002. Trend Micro believes that this placement demonstrates its strong and balanced success over the years in both its ability to execute and completeness of vision within an ever-changing market. Trend Micro’s Endpoint solution powered by XGen™ offers a cross-generational blend of layered threat defense techniques, including behavioral analysis, machine learning and automated response. Trend’s machine learning encompasses both pre-execution and runtime machine learning to address the number one customer pain point of effective detection with low false positives. Runtime detection in particular combats the growing prevalence of dangerous fileless and script-based attacks, which are designed to bypass traditional filters. To download a complimentary copy of the full Gartner Magic Quadrant for Endpoint Protection Platforms report, click here. Trend Micro Incorporated, a global leader in cybersecurity solutions, helps to make the world safe for exchanging digital information. Our innovative solutions for consumers, businesses, and governments provide layered security for data centers, cloud environments, networks, and endpoints. All our products work together to seamlessly share threat intelligence and provide a connected threat defense with centralized visibility and investigation, enabling better, faster protection. With almost 6,000 employees in more than 50 countries and the world’s most advanced global threat intelligence, Trend Micro enables organizations to secure their journey to the cloud. For more information, visit www.trendmicro.com.